Allow us to introduce you to the future of personal mobility, a future where your car not only drives you to far away places but can also power your home with the only emission produced being water vapour. 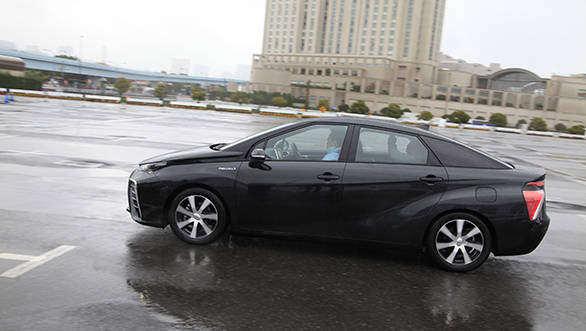 This is the Toyota Mirai, the world's first production fuel cell vehicle or FCV and it runs on hydrogen. 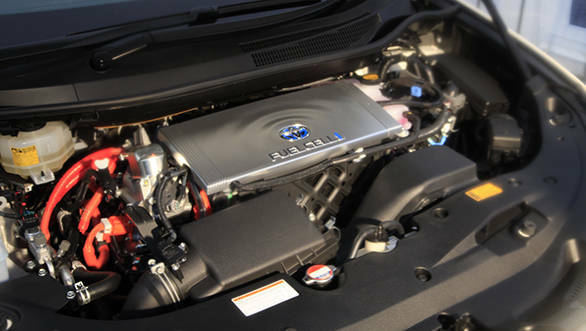 The FCV is the result of 20 years of research and development to make the fuel cell technology (again, it runs on hydrogen) safe and to a certain extent, affordable. To put that reduction in cost into perspective, Toyota's fuel cell hybrid vehicle or FCHV from 2008 cost over twenty times the Mirai does. 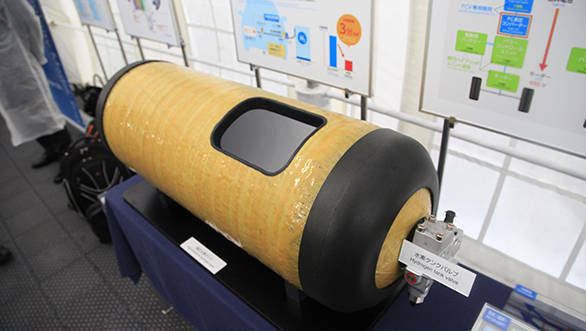 Safety, Toyota says, is ensured by two carbon fibre and fibre glass re-enforced high pressure hydrogen tanks that have been crashed tested at up to 80kmph. 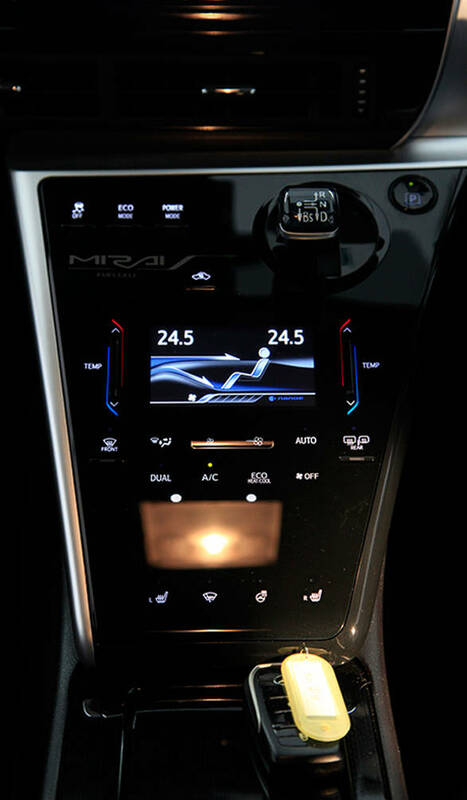 The Mirai's face is dominated by two large air scoops that house the massive radiators needed to dissipate the heat produced as a result of the fuel cell's process of generating electricity. The body's water drop contour design sees a pleasantly sloping shoulder, accented by a flared rear bumper. Overall, the design is a mix of sharp angles and soft lines and for me, personally, it's not the best looking car on the block. 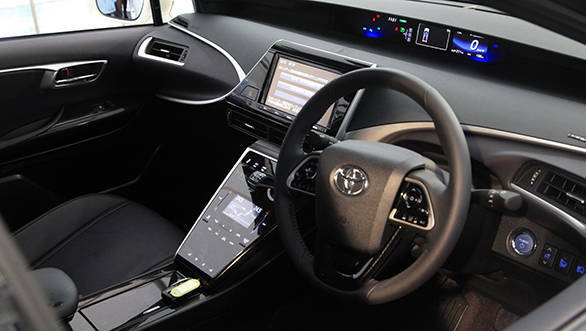 The interiors, on the other hand are fresh and up-market with a large display that dominates the central console. The instrument cluster sits in the centre and at the very top of the dashboard and while I'd prefer it to be directly in front of the driver, it is clearly visible. 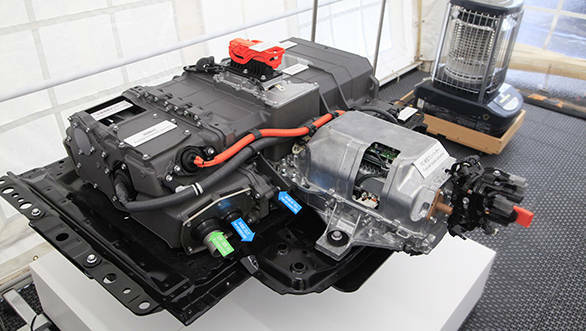 The fuel cell that powers the Mirai consists of 370 individual cells stacked together. 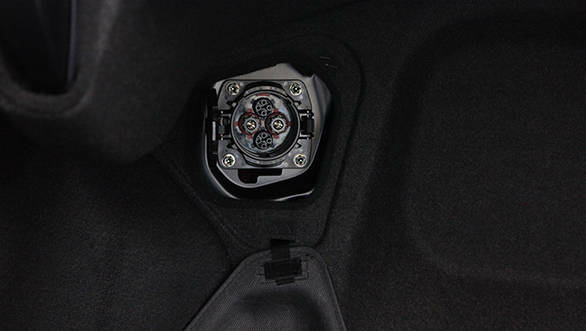 This produces electricity that drives a 155PS electric motor. 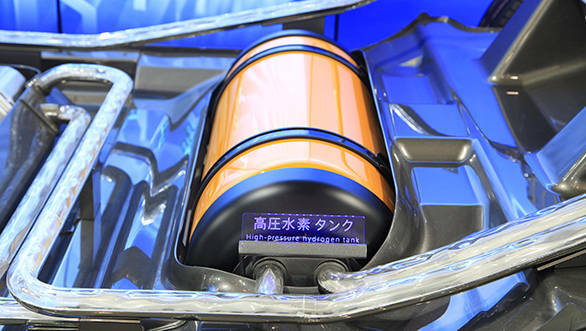 In fact, the electric motor is similar to any electric car - the big difference though is that while a conventional electric car gets its power from a battery, the fuel cell produces all the electricity needed to power the Mirai. 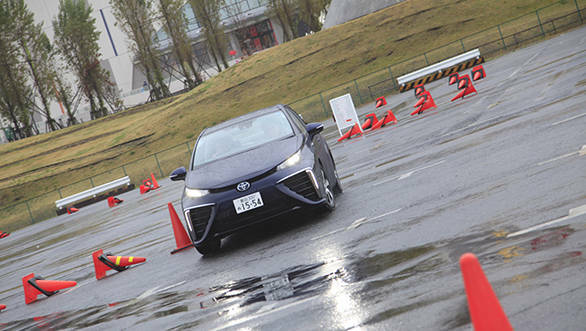 And while it takes hours to charge a battery, the Mirai needs just about three minutes to fill its hydrogen tanks. The Mirai is also able to provide 9kW of electrical power which is enough to power household lighting, a TV and even air conditioning, maintaining near normal living conditions in a home during a power outage. 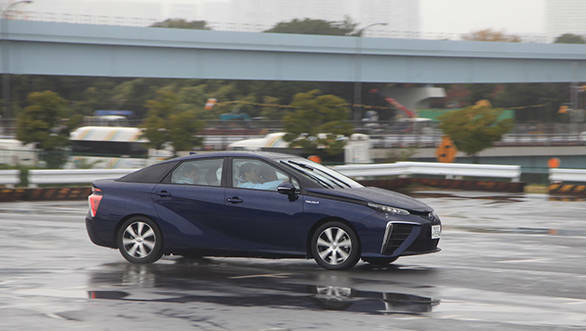 The Mirai jumps off the line like any electric with bundles of torque available right from the word go. It's a very quiet car too, with very little mechanical whine that you normally associate with electric engines. 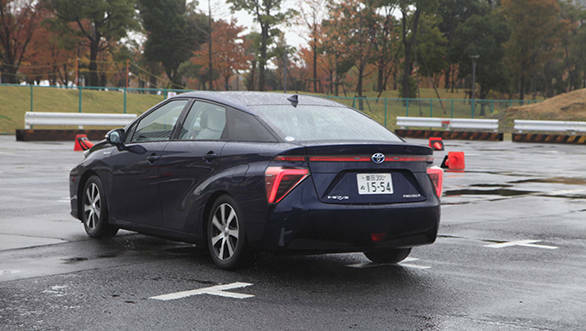 Toyota also claim that the extra stiff chassis, a by-product of extra strengthening to protect the hydrogen tanks, makes for an agile, fun car though we couldn't quite put that to test in our short drive in a vacant parking lot. 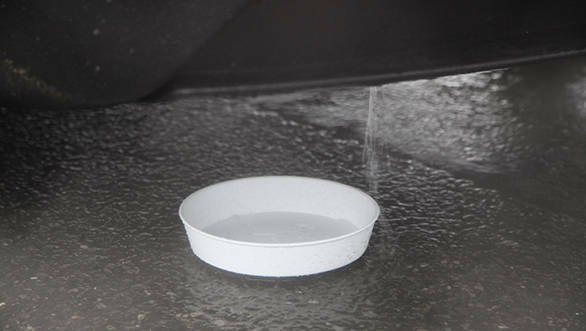 Toyota say that on a Japanese cycle test, one fill up will last a very respectable 650 kilometres. Acceleration is claimed to be a fairly brisk 9.6 seconds to 100kmph from a standing start. For the moment, the Mirai will only be produced in Japan and Toyota plan to produce 700 units in the first year, scaling up to 3,000 units by 2017. 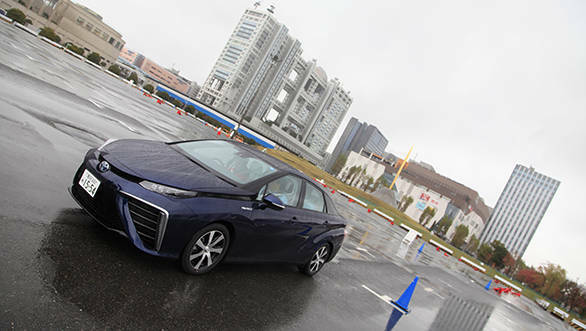 The Mirai goes on sale in Japan on December 15, this year, priced at a 7 million yen or Rs 36 lakh with roll-outs to North America and Europe planned in 2015. Infrastructure is still a big stumbling block for hydrogen powered vehicles, even in developed countries and so, there is no telling when the Mirai will makes its way to Indian shores.